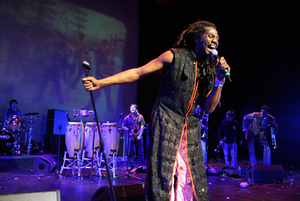 Antibalas – Spanish for “bulletproof” – is a high-energy and highly celebrated Afrobeat orchestra from Brooklyn. The band anchors this year’s Broadway hit FELA! with their musical direction and energetic instrumentalists, arranging and performing the music of Afrobeat legend Fela Kuti and originals alike. Presented by the Alliance for Downtown New York. PLEASE NOTE: Tickets will be distributed two per person outside Castle Clinton on a first-come, first-served basis starting at 5:00pm on the day of the show. Seating is provided for all the shows at Castle Clinton.